Welcome to the Solar O&M Insider, the first podcast series dedicated to solar PV operations, maintenance and asset management. This series is brought to you by Alectris, a global solar asset care innovation firm and is hosted by Glenna Wiseman of Identity3. This episode of the Solar O&M Insider features representatives of two award winning companies. They work together in the growing Middle East solar market. Headquartered in Amman, Jordan, MASE is a leading solar project and O&M developer in the MENA area led by Tareq Khalifeh. Tareq recently won the Middle East Solar Industry Association’s Solar Pioneers 2016 Gold Award which was just presented at this year’s Intersolar Middle East trade show. This episode also features Emanuele Tacchino who heads up Business Development in Western Europe & the Middle East for Alectris, a global firm offering solar operations, maintenance and asset management services and software. Alectris has won multiple awards for its solar ERP software platform called ACTIS. Glenna: Welcome to the Solar O&M Insider, the first podcast series dedicated to solar PV operations, maintenance, and asset management. This series is brought to you by Alectris, a global solar asset care innovation firm. I’m Glenna Wiseman of Identity3, your host. In this episode of the Solar O&M Insider, we are talking with representatives of two award-winning companies. They actually work together in the growing Middle East solar market. Headquartered in Amman, Jordan is MASE. It is a leading solar project and O&M developer in the main area. Heading MASE is our guest today, Tareq Khalifeh. He recently won the Middle East Industry Association’s Solar Pioneers 2016 Gold Award. This award was just presented to him at this year’s Intersolar Middle East Trade Show. We also have with us Emanuele Tacchino who heads our business development in Western Europe and the Middle East for Alectris. Alectris is a global firm offering solar operations, maintenance and asset management services and software. It has won multiple awards for its solar ERP software platform called ACTIS. Welcome to the show, gentlemen. Tareq: Thank you, Glenna. Excellent introduction. Emanuele: Thanks, Glenna. Hi, Tareq. Nice to hear you again. Tareq: Hi, Emanuele. Hi, everybody. Emanuele: It’s really a pleasure to be here, again, involved in this podcast session. Thank you for the opportunity. Glenna: Excellent. All right, so let’s start with Tareq because I would like to hear his solar story. Tareq, can you tell us briefly why you’re in the solar industry and what you see as major trends affecting solar in the Middle East? Tareq: Sure, Glenna. Thank you very much for the question. Let me just start by saying that we as a company and as a group, we’ve been involved in the energy business for over 20 years. So we’ve been following the trends and we have been developing accordingly. So solar came as a very natural and a very sensible business decision for us back in 2013, which is actually when the solar market began developing here in Jordan and also in the Middle East as a whole. We also feel very strongly about energy independence, which is a very important topic here in Jordan. The general impression is that the Middle East is full of oil. That’s partly true, not for Jordan unfortunately, which is a country very poor in natural resources. So back in 2013, a very strategic decision was made on the very high-level in Jordan for the development of the clean energy sector, which is when the people started thinking about solar, and that’s when we got into solar itself. Since then, we’ve been developing projects. We’ve been building projects and operating and maintaining them, which till now has proven to be a very good business decision. In terms of trends, Jordan was one of the first countries to develop the solar market. That followed with Egypt, the UAE, and several other countries putting plans on the table to develop solar in their own countries. What we’re seeing is a very huge boost in solar in the Middle East region. Not only solar wind and clean energy in general, one of the main trends here in the Middle East region is that there’s a very significant developer presence. There are very big projects being developed by local regional firms, be it dedicated developers, private equities, investment firms, conglomerates, and so on. So there is a very significant developer presence, and we see that continuing with the big projects being led actually by local and regional developers. Unfortunately, what we’re not seeing in comparison to the trends in Europe and the States and elsewhere is we’re not seeing a local or regional EPC presence. Most of the big projects here in the region have been constructed by international EPC contractors, whether from Europe, China, and the States and elsewhere. So that really leaves a void in terms of technical know-how and presence to maintain the sustainability of these projects. So through that void, we see that a very important trend would be actually a need, not just, you know, nice to have, but actually a need for companies which are involved and very dedicated to operation and maintenance and asset management to guarantee the sustainability of these very significant, obviously very expensive developments. So these are two trends that we see in the coming years. More countries joining the trend towards solar and clean energy, developers being local and regional and growing in terms of portfolio and so on. And unfortunately, due to the lack of involvement in EPC with regards to local and regional firms, we see a growing importance of asset managers and operators and maintainers of solar assets. So that’s to sum it up. Glenna: Okay, so if we have any listeners that aren’t familiar with the term EPC, we’re talking about Engineering Procurement and Construction. So that is the build aspect of the solar project. So let me just ask you a further question on this, Tareq, before we move on. So when I hear you talking about this, what I see is that you’ve got a team that comes in from another part of the world. They’re build experts. They build and then they leave. And then we’ve got this operational issue of who’s going to operate the plant for the next 20 or 25 years. Am I correct in that vision? Tareq: That’s basically what it is. Obviously, contractors who build the plants under an EPC contract also, you know, have a vested interest in the plant’s performance for a period of two years after they hand it over, just because that’s how the standard guarantee structure is placed. But beyond those two years, that’s where the need comes in and that’s when those contractors actually really don’t have a vested interest in how the plant performs. Glenna: And now we’re talking here about large plants, because your firm does build and it does build residential and smaller commercial as well. Is that correct? Tareq: That’s right. Yes, we are talking about large plants, so utility scale and multi-megawatts, which is where we’re seeing the lack of involvement of local and regional EPCs. You know, say for a few odd examples, but that’s the general trend. Glenna: Okay, so that opens up this window where the local expertise for operations, maintenance, and asset management is needed. And so, Emanuele, can you talk to us a little bit about what the trends that you see in that particular aspect of the market in Middle East? What trends do you see there and how do you see the market evolving? Emanuele: Well, I have to agree, of course, with what Tareq said. We are also experiencing a lot of new PV capacity being added in a lot of Middle East countries, of course Jordan, but also in Kuwait or others. And the nice fact is that in all of these countries, of course, there is obviously an enormous solar potential. And their institution and governments are perfectly aware of the importance of developing in the right way solar and in general, renewable sources. To my opinion, it’s quite obvious, it’s a fact now that Middle East represents the next game changer in the solar world. It is already like that. Let’s just think about the last unbelievable prices offered in the PPAs from their bidders, Abu Dhabi, for example. I see that all of these opportunities shall drive and force in some way all the solar industries, EPCs, O&M to an expected level of competitiveness in terms of gross efficiency, reliability to level absolutely unexpected only few years ago, and that this is especially true for O&M services that must be provided for the whole life of these big plants. So let’s say that all of these countries have a great opportunity to rely on PV players, of course, with international broad profile and as of now, even more than 10 years of PV experience, and it’s true to all the stakeholders in the PV chain and in the chain of bringing a project up to the construction phase or up to the grid connection, that there is the need to rely on professional counterparts, not only the EPC but also relying on independent O&M contractors from the very beginning. Even before their commissioning, even during their construction phase, to supervise that the construction is performed in the right way. So this is the main trend that we see not just in the Middle East, I have to say, but globally. We have been involved in various ways, in quite all of these big tenders in Middle East, invited from very, very big players, very big EPCs or great investors, and we can confirm that there is this need. Every bidder in a tender needs to demonstrate a clever plan for successful long-term operation and for successful management, of course, of such solar facilities. So they need to have the right O&M partner on their side with international expertise, with the right, of course, track record. And as I said, this is in general a global need. In our vision, there is a huge need of standardization of processes as well, best practices, but not only, also standardized contractual terms that these players need to bring to the table and this will help, of course, to bring the solar development even further in all of these various markets. Glenna: Excellent. So, Tareq, your company was one of the first in the Middle East to really focus on solar PV operations and maintenance. You’ve touched a little bit on the need that you see in the market. Talk to us a little bit about how important you think this is to include in your services to the market and some of the kinds of things that you see that your team is getting to work with. Tareq: Sure. I mean, both Emanuele and I spoke about the growing trend of independent O&M contractors globally. I see the market here in the Middle East the need for independent O&M contractors would be a bit more significant than elsewhere, perhaps in Europe or the States or in Asia. For one reason, which I noted earlier, you know, projects in Europe usually get those by European contractors who also could be involved in the long-term operation and maintenance of the plant. For projects in the Middle East, the trend that we’re seeing is that, like I said, these projects are built by foreign contractors from the perspective of, you know, the Middle East region. So, you know, their vested interest in setting up an operation and maintenance structure locally in the Middle East, you know, could be a limitation to their involvement in the long-term operation and maintenance for the plant. So that brings the opportunity where, you know, global O&M players with a right structure setup with local players as well to join in these opportunities and tackle them and be directly involved in the long-time operation and management of these plants. So this is what, you know, you mentioned we were one of the first to focus on that sort of business sector. Because we see that once these plants are set up and running and operational, they will need someone to take care of them and manage them and make sure that they’re running at peak performance. So it’s sort of a forward-looking business strategy but we’re very confident that it will be a successful strategy. We’re even seeing success right now, where developers and even lenders have welcomed the idea of the setup that we have with Alectris in Jordan and the region being involved in operating and maintaining plants that we have in Jordan. So that is an example of how successful this business module has been. Glenna: So we’ve got this melding of two best case scenarios. It sounds to me like you’ve got the international experience of a company that is specifically focused on operations, maintenance, and asset management married to the local experience that is in the market. And, Emanuele, this is how Alectris and MASE are working together in the Middle East, I believe. So can you tell us about how this is working? Emanuele: That’s very correct, Glenna. Of course, when we are saying international O&M players acting in these new emerging markets, they absolutely need to rely on reliable local partners and to transfer knowledge to this partner to be sure that everything is done properly on the field. Because, of course, it’s not sustainable to imagine an O&M player active in all of these countries with these projects that are everywhere. So the need of local partner is absolutely true, and our alliance with MASE perfectly describes this situation. In Jordan, we are providing O&M services according to the top European standards, that is a very nice thing for lenders and investors, through PV plants in Jordan first and in Middle East in the future, where MASE is leading the field operation and the maintenance services. 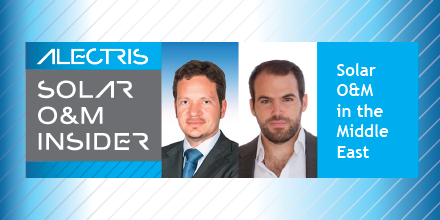 And we, as Alectris, guide, supervise and support the various O&M activities with our global asset and technical expertise and especially with our plant management software ACTIS. Again, it’s very important to increase the confidence of investors and lenders in a PV project in an emerging market. But in every part of the world it is needed proven monitoring because this is the heart of the control of a PV plant, of its performance and that the proper operations are performed. Since Jordan and Middle East region, in general, have a very high potential in solar, back to what Tareq said, with very little qualified local contractors or with maintenance competencies, we have been engaged by MASE and Tareq in the past to partner with them and with international top-level EPC constructor in plant under construction, to bring our O&M services from the commissioning phase of the plant, granting a full bankability of the whole model. So let’s say, the achievement has been granting the commitment on performances with our monitoring, with our intervention, and with our high-level services to the major lenders involved in this project. And we’re talking about very big players like IFC, the World Bank, and so on, for the happiness, of course, of their technical and legal advisors that were requiring very demanding constraint to approve the financing. So let’s say the alliance has been conceived to meet this very demanding bankability environment, and we have achieved to put in place and maximizing the synergies between the two companies. Because MASE brings excellent local knowledge, a lot of experience, and we as Alectris put on the table our global experience in O&M, we have performed the transfer of knowledge to MASE field technicians to perform operation smoothly and in the right way and we provided our solar ERP, ACTIS that allows the continuous monitoring and managing of the plant with real time control of O&M services, activities, incidents, and so on. I have to say, of course, this approach ensures a long-term viability, financially speaking, to this project and everything is structured according to the best practices that we as Alectris can bring to the table and MASE can duly implement on field. Glenna: Well, it seems to me too that these emerging markets don’t have the luxury of building up that local expertise in quite the same way that even Europe or United States has had. I mean, we just did this week that we’re recording this, had the announcement that the COP 21 Paris Agreement is moving into full force and that our world basically depends on no new fossil fuels. So it places an urgency on solar and wind and other clean energy technologies that we just don’t have time. So if you can combine the expertise and move things along faster in a new market, then that makes perfect sense at least to me. So, Tareq, so we’ve kind of talked really broad brush here in terms of how you all have come together in this Jordan, in Middle East market. Can you give us an example of a project and how that your two companies are working together on it? Tareq: Sure. I’d just like to make a few comments on what has just been said. You know, you mentioned time, and time is the main factor here. It is really not that local firms here in the Middle East don’t have the capacity or the capability to develop up to international standards and so on. It’s really a matter of time. We all know that the solar market is developing at an unprecedented rate. Gigawatts and gigawatts of projects are being developed and built over a very short period of time. So to get to a point where, and Emanuele mentioned it is very important, where to get to a point where you’re bankable and are able to participate in these projects as an O&M contractor, you really need time to build up this portfolio to prove to lenders and developers that you’re able to do so. So that was the main or one of the main underlying aspects of the alliance with Alectris, and I think it proved to be a very successful alliance. I don’t agree that some people would say that it is a simple process and can be done at any point in time. I think that we have sort of struck a balance with Alectris. I think we have perfect synergies. So that was one of the main sources for success. So I’ll give you an example on a project that we’ve just realized bankability on and on which Alectris and MASE are working together. Arabia One is one of the first projects possibly in the Middle East region to be commissioned. It is a 10-megawatt project based in Jordan. We as MASE are part of the development team of the project. So we have led the development of the project with other international partners. The project has been operational since the beginning of August, so it’s been two months now since the project has been commercially operational. At the outset, it was one of our targets as MASE to handle the operation and maintenance of the project. So it was more or less a target to have an owner/operator model. Obviously, that brought challenges with it, main challenge being bankability. We’ve never operated or maintained a project of that size before, so that brings challenges. The project is being funded by the IFC, the International Finance Corporation, which is part of the World Bank, co-funded by FinnFund, which is short for Finnish Funds for Industrial Development. So you’re talking about big names who really, you know, need to be confident that their 70% or 80% investment in this project is going to be in safe hands. So that really brought along the idea of developing a bankable structure with a company like Alectris, whereas, you know, obviously… Initially I can be honest that the target was this project itself, but that led fortunately to a very synergistic setup with Alectris with which we are tackling the Middle East market as a whole. So I don’t want to get too much, you know, into the details of the contractual structure because that would take some time. But what Emanuele has described, the fact that where Alectris provides the track record, the global O&M experience, and most importantly, the ERP structure with ACTIS and where MASE provides the local expertise, the boots on the ground and the local experience, that sort of setup and that sort of collaboration and marriage of synergies is what made this opportunity successful. So we have achieved really something which is bankable. We have achieved the very stringent requirements of lenders such as the IFC and FinnFund and their technical advisors who were really not easy to deal with. They had very tough requirements, which Alectris and MASE were very happy to oblige with, and here we are. We are operating and maintaining this plant together using ACTIS, using the backend of Alectris, using the global support of the Alectris network, you know, with the service, with the maintenance services being implemented by the very qualified MASE team, and that’s the setup which we think is replicable by Alectris and MASE in the Middle East region as a whole. We think that it’s going to be very difficult for others to replicate that sort of structure because we have started very early on in the game, where we can easily offer that sort of service at any point now. We have achieved bankability. We have achieved approval by the toughest lenders known to the lending community. So it’s a setup which we think is a winning setup, and that’s something that we can prove on the grounds with the real projects and not just theoretical. Glenna: Excellent. And I’m sure that if folks are interested in seeing that, getting more information on the Arabia One solar project, they can go to your website and take a look. And that is… Tareq, can you give us the website address, please? Glenna: Okay, excellent. All right, so it’s interesting to see how vibrant the market is in the Middle East and Jordan. And, of course, for any industry, the vibrancy is out pictured with the number of events that are happening. 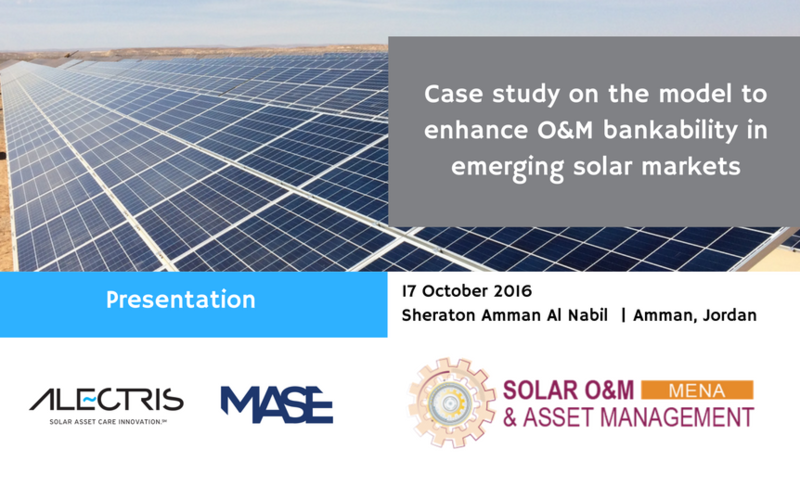 There’s an event coming up here in October, it’s in Amman, Jordan, called the Solar O&M and Asset Management MENA event. And Tareq, you are presenting a case study there with Alectris called “A Model to Enhance O&M Bankability in Emerging Solar Markets.” Can you give us a brief, just a brief kind of overview of what that presentation is going to be about? Tareq: Sure. Well, I mean, this conference happening in Jordan is, you know, obviously a proof that there is growing importance and interest in solar O&M and asset management in the Middle East region. And Alectris, you know, the team at Alectris and the team at MASE are basically going to speak about the successful model that goes together, which we think is replicable to other countries in the region. We’re going to focus on speaking about, you know, the main difference between how a classic EPC plus O&M model looks like and how a more optimized model, in our opinion, where there’s the EPC and the developers and the third-party or an independent O&M provider working together from the first stages of the plant development and where, you know, the EPC hands over the operation and maintenance activities to this independent O&M provider, which focuses on the operation and maintenance of the plant and which has the core business to do that. The presentation will focus on building up bankability, how we’ve achieved such a model being considered bankable and acceptable to lenders. We are going to speak about how we are setting up the model to mitigate the potential risks out of this model, especially risks during the operational phase. We will touch upon the proposed structure of how this model is structured, how there is increased involvement from Alectris as the global player in the initial stages and the training phases and how there is a very clear structure of handover to the local player being MASE. And we’re going to really compare these two models together, talk about the advantages and disadvantages of each model, and we think that the advantages of the independent O&M model outweigh the advantages of the classic EPC plus O&M model. And we’re going to speak about the results and what we have seen in operating real plants with this model that we are proposing, and that’s something I think that is very important. Because there’s been lot of theoretical talk here in the Middle East about projects, that there’s been a lot of planning, a lot of written papers and so on, but there are very few examples of on-the-ground achievements, and we think this is a very important one, and this is sort of the model we’ll be presenting. Glenna: And I think it’s heartening that you are already talking about the importance of bringing that what will eventually be the long-term O&M and asset management competency into the conversation from the very beginning, that those kinds of conversations are happening around the world, and third-party O&M suppliers are trying to get others, builders and developers, to have that type of input from the very beginning, and it makes a big difference in the project on the long-term. So I think it’s really great that you’re doing that now with a concrete example. Tareq: It does. It does make a very significant difference. And what we’re going to present is just that, and people in the industry can really compare what we’re talking about and see the results and compare, you know, what’s most of them would have been exposed to, which is the classic EPC plus two-year O&M model, and there is a difference. I mean, there is a clear difference in these two models. Glenna: Excellent. All right, so we’ve touched on this concept of bankability and the importance of the O&M contribution to a project influencing its bankability. I know, Emanuele, your firm has talked a lot about this in the industry and is presented, including this event here coming up. Can you tell us a little bit about your view of bankability and how it relates to O&M or how O&M relates to bankability? Emanuele: Yes, of course. Bankability is, let’s say, the most crucial aspect in PV development, starting from development up to construction, through the whole life of a PV plant, everything needs to be performed in the right way to grant the bankability of the investment and grant the financing to make things happen. So let’s say, it’s also connecting to what Tareq said, the Arabia One concept, EPC and separated O&M. So not the standard formulas of EPC and two-years of warranty period. It is quite a new thing and not easy absolutely to achieve because it has never been performed like that in construction and the starting of operation of a PV plant. This is something that is now required from investors and lenders because they have had very bad experience in Italy but not only also in Spain of local EPCs that went bankrupt, that then abandoned completely their plants after some years. And this is absolutely nothing they are willing to live again. So, especially for these emerging new markets, there are higher risks and they absolutely need every kind of guarantee that their investment in the solar facility will continue to be a good investment even 20 years after the commissioning or even more. So let’s say who is representing a PV project to a bank, to a lender, need to demonstrate a very strong O&M plan as it is not anymore sufficient to be or have a reliable EPC. You need to bring on the table the right player. You need to bring on the table that this player is using the highest industry standards and best practices, and everything must be targeting the perfect performances of the plant that translates into its bankability. Of course, this O&M player needs to have a proven track record. And in Alectris, we think about this model from the very beginning. We were born as a pure O&M servicer. So what is happening there was very clear to us also several years ago, and we are convinced also in the importance of the standardization of all of these things, because bankability needs to follow standardization that is something, again, quite new in this solar industry. We are currently members of various important entities focused on standardization of O&M procedures, best practices, and so on. Both the US and Europe, where by the way we are also leaders of the relevant O&M task force. And I think this kind of commitment and compliance with these international standards, even if these are yet to come but they are on progress, let’s say right now is very crucial to demonstrate these long-term commitments that the investors and the lenders would like to see. So let’s say the key for us to increase this bankability of a project in an emerging market is then to include a very strong O&M component that they need and, of course, have to rely on a strong local partner, like MASE in Jordan, as said before, and both of the parties need to show to investors and to lenders that they give the assurance that their facility would be perfectly managed and the performances shall be the maximum as possible forever. This is what makes a PV project bankable. Glenna: So it’s interesting because, first of all, we’re aware that the efforts to standardize processes and expectations create transparency to investors and owners, clear contracts. All of that kind of thing is indeed a worldwide effort. So I’d like to hear from Tareq in terms of how he sees the Middle East developing in that area. Do you think you’ll use, you know, you’ll take, from say solar power Europe’s standardization efforts and O&M may be combined with what’s going on with the U.S.? How do you see that, Tareq? Tareq: I think at some point we’re going to get there, and I think not by choice, but we have to get there simply because solar is now a global market. It’s not really region-specific or country-specific. We see lenders from all over the world being involved in funding projects in the region. We see developers from all over the world being involved in developing projects in the region, and also we see contractors, global EPC contractors and O&M contractors looking at the region as well. So it is something that we will definitely get to at some point. It is not something that is addressed. You have to remember that the solar market in the Middle East region is two to three years old. So it’s roughly a new market. Given that, we are talking about gigawatts and gigawatts of capacity, both planned and some of it being implemented already. So it will come to a point where we will need to follow the standards. We will need to abide by them to the comforts of the project owners, be it the developers, the lenders, who expect to see those sorts of standards, whether it’s a project in Jordan or whether it’s a project in the States or wherever it is. So, you know, with the global trend, it’s something that we need to get to. And it’s something that we are looking at MASE very early on, and we do look to take advantage of Alectris’ experience and standardizing these processes and try to start very early on. In fact, many of the activities that were granted undertaking at the Arabia One plant that we’re currently managing with Alectris are based on global standards, which Emanuele has touched upon. So in some ways this is something that we have applied. It is something that is very looked upon positively by lenders, developers, project owners, and so on. So these developers, lenders, and the rest, they do expect that these standards be implemented. They are not requirements of say the local government entities and so on whereas other places, they could be. But they are expected, they are looked upon positively by developers, lenders, and so on. So that brings this all to bankability. Bankability is a very important point. I mentioned that we are also developers and not only operators and not only O&M service providers. We are also developers, and bankability is at the heart of these projects. Bankability can make lending cheaper or more expensive. It can make a project and break it. So having the right setup, which, again, we think the right setup is an independent O&M model with global support, global track record, and very strong local presence enhances bankability, which makes, you know, lenders happy to lend, developers more comfortable in developing projects, and projects themselves performing much better than others, which reflects very positively on everyone involved. So bankability is a very important factor. And I think, you know, the more we focus on bankability and the more we focus on developing structures which enhance bankability, the more projects we’re going to see and the more money we’re going to see flowing into the region. So, you know, whether we like it or not, we need to step up and we need to sort of adopt these standards, these global standards. And this is something that we are doing already at MASE supported by Alectris when it comes to O&M. So, yes, I see things happening at a very fast pace, and I think in terms of standardization, in terms of market standards and so on, I think we will pick up with Europe and the U.S. and the rest of the world very soon. Glenna: Well, my view of this as well is that savvy investors, global portfolio owners understand the critical nature of this part of the market and that the care in feeding, if you will, of their assets worldwide. And so I think it gives you all a competitive edge to be doing this early in what you’re doing, Tareq. So I think that’s definitely something. All right, gentlemen, any last thoughts, anything that we need to have to say here in terms of solar O&M in the Middle East to close out? Emanuele: Yeah. From my point of view, I can add that I always think about these giant scale projects, these big tenders in UAE or in other Middle East countries. I think this is a fantastic opportunity for solar. Again, solar in Middle East would be a game changer because we are talking about PV plants in a harsh environment, basically in a desert, with high temperatures and wide temperature range, the sandstorms and so on. So let’s say with a lot of requirements from the off-takers, with operators, you need to work at night and so on. I think these plants would be realized and everything will happen. This will bring all the players in the industry to another level, especially O&M operators. I see a lot of beneficial impacts on O&M operation, technologies also, from this new emerging market in Middle East and the plants that shall be realized. And I think it shall be amazing what we’ll see even before 2020. I think solar O&M best practices we are drafting down right now should be of another planet in those years, for sure. Tareq: I agree with Emanuele. I think the fact that the region has to offer very different environments than the rest of the world. You are talking about very harsh desert conditions in some places. You are talking about very high altitudes, very low altitudes. In fact, Jordan has the lowest altitudes in the world. So you’re talking about very different operating conditions, very unique ones as well. So that is going to be a very interesting phase in O&M, and that, again, you know, brings with it the importance of local presence. It brings with it the presence of a setup where, you know, you are able to hit the ground running from day one with what we have developed. An example is what we have developed with Alectris, and I think it’s a winning strategy. And I think that together with Alectris and what we’ve realized together, we’ll be able to build a very good track record in one of the most interesting environments and the areas in the world. So a lot of capacity, a lot of a need and very fast paced. So you need to hit the ground running from day one, which is, you know, something that is doable with what we have developed. Emanuele: Yes, I’m sure of it. Glenna: Excellent. Well, Tareq, thank you for joining us in this podcast session, and congratulations again on your prestigious Solar Pioneers award. Before we close, can you share how our listeners can reach you and your MASE team? Tareq: Thank you very much for inviting me. It’s been a pleasure joining you and Emanuele in this discussion. And I don’t think it’s going to be the last session about O&M in the Middle East. I think there’s lot to come. The best way to reach me is to email me at tkhalifeh@mase-energy.com. Logging into the website would be a very good idea to see how what we’ve spoken about today is being realized on the ground. And the main contact information is on the website as well. I look forward to hearing from anyone who would like to learn more about O&M in the Middle East. Glenna: Excellent. So, Emanuele, thank you for taking time to speak with us. We really do appreciate the support Alectris lends to this insider view of the solar PV O&M industry around the globe. I’m Glenna Wiseman, your host. The Solar O&M Insider podcast series is brought to you by Alectris at alectris.com.